Promotion in Mathematik über "Domain Decomposition Methods in Multiscale Geopotential Determination from SST and SGG" bei Prof. Dr. Willi Freeden, Note: "sehr gut"
Wissenschaftliche Mitarbeiterin in zwei Drittmittelprojekten am Fachbereich Mathematik der Technischen Universität Kaiserslautern, Deutschland, während der Promotion, Betreuer: Prof. Dr. Willi Freeden; Note der Promotion: "sehr gut"
Kerstin Hesse, Ian H. Sloan, Robert S. Womersley: Radial basis function approximation of noisy scattered data on the sphere. Numerische Mathematik, 137 (2017), 579-605. Kerstin Hesse, Robert S. Womersley: Numerical integration with polynomial exactness over a spherical cap. Advances in Computational Mathematics, 36 (2012), 451-483. 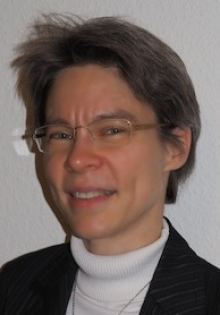 Kerstin Hesse: Complexity of numerical integration over spherical caps in a Sobolev space setting. Journal of Complexity, 27 (2011), 383-403. Kerstin Hesse: The $s$-energy of spherical designs on $S^2$. Advances in Computational Mathematics, 30 (2009), 37-59. Kerstin Hesse, Paul Leopardi: The Coulomb energy of spherical designs on $S^2$. Advances in Computational Mathematics, 28 (2008), 331-354. Kerstin Hesse, Q. T. Le Gia: Local radial basis function approximation on the sphere. Bulletin of the Australian Mathematical Society, 77 (2008), 197-224. Kerstin Hesse, H. N. Mhaskar, Ian H. Sloan: Quadrature in Besov spaces on the Euclidean sphere. Journal of Complexity, 23 (2007), 528-552. Kerstin Hesse, Frances Y. Kuo, Ian H. Sloan: A component-by-component approach to efficient numerical integration over products of spheres. Journal of Complexity, 23 (2007), 25-51. Johann S. Brauchart, Kerstin Hesse: Numerical integration over spheres of arbitrary dimension. Constructive Approximation, 25 (2007), 41-71. Kerstin Hesse: A lower bound for the worst-case cubature error on spheres of arbitrary dimension. Numerische Mathematik, 103 (2006), 413-433. Kerstin Hesse, Ian H. Sloan: Cubature over the sphere $S^2$ in Sobolev spaces of arbitrary order. Journal of Approximation Theory, 141 (2006), 118-133. Kerstin Hesse, Ian H. Sloan: Optimal lower bounds for cubature error on the sphere $S^2$. Journal of Complexity, 21 (2005), 790-803. Kerstin Hesse, Ian H. Sloan: Worst-case errors in a Sobolev space setting for cubature over the sphere $S^2$. Bulletin of the Australian Mathematical Society, 71 (2005), 81-105. Willi Freeden, Kerstin Hesse: On the multiscale solution of satellite problems by use of locally supported kernel functions corresponding to equidistributed data on spherical orbits. Studia Scientiarum Mathematicarum Hungarica, 39 (2002), 37-74. Kerstin Hesse, Ian H. Sloan: High-order numerical integration on the sphere and extremal point systems. Journal of Computational Technologies, 9 (2004), 4-12 (eingeladener Artikel). Kerstin Hesse, Ian H. Sloan: Hyperinterpolation on the sphere. In: Frontiers in Interpolation and Approximation (Dedicated to the Memory of Ambikeshwar Sharma) (Hrsg. : N. K. Govil, H. N. Mhaskar, Ram N. Mohapatra, Zuhair Nashed und J. Szabados), Chapman & Hall/CRC, 2006, S. 213-248 (mit Peer Review Prozess). Kerstin Hesse, Ian H. Sloan: Optimal order integration on the sphere. In: Frontiers and Prospects of Contemporary Applied Mathematics, Series in Contemporary Applied Mathematics CAM 6 (Hrsg. : Tatsien Li und Pingwen Zhang), Higher Education Press und World Scientific, 2005, S. 59-70. Kerstin Hesse: Domain Decomposition Methods in Multiscale Geopotential Determination from SST and SGG. Doktorarbeit, AG Geomathematik, Fachbereich Mathematik, Technische Universität Kaiserslautern, 2002. Veröffentlicht beim Shaker Verlag, Aachen, 2003, 290 Seiten. Kerstin Hesse, Ian H. Sloan, Robert S. Womersley: Smoothing approximation of noisy scattered data on the sphere with the hybrid approximation scheme. Kerstin Hesse, Ian H. Sloan, Robert S. Womersley: Local RBF smoothing approximation of noisy scattered data on the sphere. Willi Freeden, Kerstin Hesse: Spline modelling of geostrophic flow: theoretical and algorithmic aspects. Schriften zur Funktionalanalysis und Geomathematik Nr. 15, Technische Universität Kaiserslautern, Dezember 2004, und Applied Mathematics Report AMR04/33, University of New South Wales, Dezember 2004, 29 Seiten. Dies ist eine verbesserte und neu geschriebene Version von Preprint 3. Kerstin Hesse: Neugestaltung der "Höheren Mathematik A, B und C für Elektrotechniker" -- Nutzung der Lehrmaterialien durch Studierende. In: Hanse-Kolloquium zur Hochschuldidaktik der Mathematik 2015: Beiträge zum gleichnamigen Symposium am 13. & 14. November 2015 an der Universität zu Lübeck (Hochschulschriften zur Mathematik-Didaktik) (Hrsg. : Walther Paravicini und Jörn Schnieder), WTM-Verlag, 2016, S. 86-102.